They gotta go. All the slaves have become citizens. An antiquated law that today is abused by many different countries. I have to agree with this, and it should stop. I thought you were a Constitution purist. It's right enshrined in the Constitution. (10-30-2018, 07:22 PM)Duchess Wrote: I thought you were a Constitution purist. It's right enshrined in the Constitution. Yes, for legal immigrants. Not for illegal. Trump will finally get the ball rolling so the courts can define the original amendment. The executive order will get addressed but as far as the legal repercussions over it. He is right. He was right in the Muslim ban as decided by the courts and is right with this. It's not his first ride on the pony at the mall. He has legal eagles and stuff. !952 was a long time ago and things have cha cha changed. The 14th amendment avoids any restrictions when it guarantees citizenship to all children born on U.S. soil. So, a judge who truly applies originalism interpretations when deciding cases, like Scalia and reportedly Kavanaugh, would likely rule against adding in a restriction in reaction to a current political dilemma. The Supreme Court would very likely have ruled against a "Muslim" ban too, in my opinion. That would have amounted to religious discrimination and is why the original Muslim ban was revised three times and morphed into a 'travel ban' before being legally blessed. If the Supreme Court actually did revise the 14th amendment, that would open the door more for a legal push to revise the Second Amendment to define "well regulated militia" in today's world and possible restrictions on arms. Those who want to revise the First Amendment to specify speech restrictions would also be lining up right behind a 14th Amendment revision, I suspect. But, I don't think Trump cares much about 'anchor babies' anyway. I think he knows some of his strongest base supporters surely do, so he's throwing it out there again. I could see going forward, but I assume he is talking about those that are already here. Hell! Does no one understand Trump at all after all this time? Trump has a position. Let's say it is immigration or trade. He has a position. With this position is the recognition, things are not how he wants it, there are unplumbed extreme positions far greater than what he would reasonably accept, anything he does will get an amount of pushback and outrage, and the degree to which it manifests, probably will not be THAT different. So he will have a preferred position and come in with an offer far greater than what he wants. Greater still than what he will happily or begrudgingly accept. He will casually throw it out there and will not blink nor justify himself nor be wishy-washy about it. People will believe this to be the line in the sand. It isn't. He wants an outcome in line to what he is asking for but now makes himself open to possibilities. People go crazy and denounce it and he waits and gradually there is movement and he sees where he has ground to gain or must give and works from that position. Yeaup, it is so great that you understand that Fry Guy. You really pay attention. My belief is that Trump does not know the laws at all-so he throws something out there and waits for it to be debated, discussed so that he can gahter the proper information and then a decision is made. He is really smart and sure knows how to work this system. I can't believe all the people going crazy over the things he says. He will toss it out there, then the courts will take it and run with it. Hopefully the anchor baby thing will be taken out. 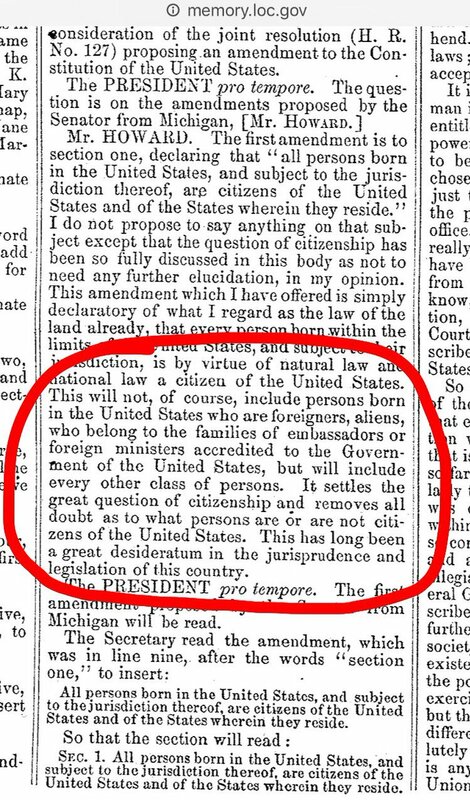 I myself do not think that an illegal has any right to the 14th amendment or any other, they are not citizens yet. There is an entire industry set up especially in China to take advantage of this. Obama was accused of killing an American during a terrorist raid. The "american" that was killed was an anchor baby that was born in the U.S. and was living overseas. In fact he had been overseas for quite a long time and was indoctrinated into a terrorist organization. He got a lot of useless crap over that one. The 14th Amendment has been used to help support a number of important civil rights cases and helps to ensure the U.S. doesn't go back to allowing some locales to eliminate/reduce the rights of any citizen based on race or religion (regardless of place of birth). If President Trump wants to change some/all of the law and overturn precedent, he should be working through Congress, in my opinion. I don't believe the Supreme Court would uphold an Executive Order to repeal/revise the Constitution based on a political dilemma. Chief Justice Roberts said just a couple of weeks ago that's precisely something the Court strives to avoid. And, the 14th Amendment has been debated several times in court of public opinion in the past. There was never broad support for repealing or amending the amendment among the majority of constituents represented by Congress. Unless that's changed, it's unlikely there would be enough congressional support from either party to get a bill passed. Plus, I think it would be hard to make a solid evidentiary case that 'anchor babies' are generally more problematic to the country than citizens born to citizens. Anyway, I believe "anchor babies" were made an issue in the 2016 presidential election to appeal to voters who have problems with immigrants in general, which likely worked. And, I think it's being invoked again in public to appeal to those same voters for the same reason just ahead of the 2018 midterms. Maybe it will work again, maybe not. Either way, I don't see any compelling legal reason to change the Constitution and do see compelling reason not to do so. So, I don't believe efforts to repeal/revise the 14th Amendment would be upheld by the Supreme Court. trump's first three kids were born to an immigrant. (10-31-2018, 11:57 AM)Duchess Wrote: trump's first three kids were born to an immigrant. I think I read that she did not become a U.S. citizen until like 11 years after she and Trump married, after Trump's children were born? Since she was white, presumably a documented legal resident, and married to a U.S. citizen....I don't think most of the people who have a problem with anchor babies would want to deny citizenship under those kinds of circumstances. They didn't have a problem with Melania Trump sponsoring her parents' citizenship when they were rallying against 'chain migration' for others. Anyway, any attempt to change birthright citizenship would require a good deal of thoughtful deliberation. For example, what if an Iranian woman comes here legally on a student VISA, finds out she's pregnant by her Iranian boyfriend back home, and has a child on U.S. soil? And, how about an undocumented Central American man who has a child on U.S. soil with a Mexican woman legally here on a work visa? Or, an undocumented Somali woman engaged to and impregnated by an American man? Trump falsely claimed the other day that the U.S. is the only country that grants citizenship based on place of birth. There are actually 30+ other countries which do so as well, but not the most developed countries. I think Canada grants full citizenship to any child born on Canadian soil so long as one of the parents is a Canadian citizen. (10-31-2018, 12:26 PM)Maggot Wrote: She was legal. So, do you believe citizenship should be granted to the U.S.-born baby of an Iranian woman impregnated by an Iranian man back home, so long as the woman is legally residing here on a student visa? (10-31-2018, 12:25 PM)HairOfTheDog Wrote: They didn't have a problem with Melania Trump sponsoring her parents' citizenship when they were rallying against 'chain migration' for others. No, they didn't & duck that question every time it's asked. Not that you asked that question! I was referring to the media sometimes throwing it out there when talking about immigration. If she is legal yes that is not illegal. Should Chinese citizens be able to fly here in the 8th month of pregnancy on a tourist visa to have a baby that becomes an american citizen? Then fly back to China with the little bambino. Should Chinese citizens be able to fly here in the 8th month of pregnancy on a tourist visa to have a baby that bocomes an american citizen? Then fly back to China with the little bambino. I don't have any problem with the 14th Amendment or birthright citizenship, though dual citizenship does sometimes cause logistical challenges for both countries' governments. Anyway, if the mother being of 'legal residency' in the U.S. is your criteria for granting citizenship to a child born on U.S. soil, then the child of the Chinese woman should obviously be granted U.S. citizenship by your criteria. How do you feel about a U.S.-born baby of an undocumented Mexican woman when the boyfriend who impregnated her is an American citizen? Current time: 04-18-2019, 08:50 AM Powered By MyBB, © 2002-2019 MyBB Group.